A Terror Breach at Israel's Border? 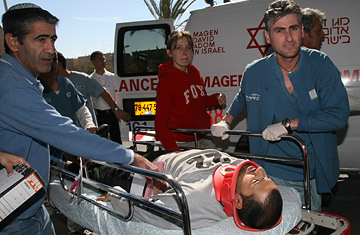 Israeli medics wheel an injured person into a hospital in the southern Israeli city of Beer Sheva on February 4, 2008, following a suicide attack in the town of Dimona. The Palestinian bomber entered the Israeli cafe in Dimona on Monday morning, ordered a coffee with extra sugar and drank it down slowly, say eyewitnesses. Then he blew himself up, killing one woman and wounding 10 other Israelis. An ambulance crew arrived within several minutes to this pedestrian mall in the Negev, just 10 kms away from Israel's top-secret nuclear reactor. As a doctor rushed among the injured, he paused to open the jacket of one severely wounded man and found that he was wearing an explosives vest. The victim was a second suicide bomber, who was also supposed to blow himself up. Says Chief Inspector Kobi Mor, "When I arrived at the area, one of the people told me that there was a terrorist who was still alive. I pulled out my gun and saw him reaching towards his explosives belt. I fired at the terrorist." Mor thought the terrorist was dead. "But two minutes later, he raised his hand again. I went into a kneeling position and fired four more shots at his head," he later recounted to the press, explaining that he carefully aimed his shots not to detonate the vest. The policeman's quick reactions no doubt saved lives in Israel's first suicide attack in over a year. But the bombing seemed to confirm fears by Israeli security chiefs that terrorists had joined thousands of Palestinians who streamed through the breach made last week in the security fence between Egypt and Gaza. The bombers' route probably took them into the Sinai, where Egypt's long and sporadically unpatrolled desert border is riddled with smugglers' trails used by Bedouin. For the right amount of money, these tribesmen are willing to bring anything into Israel  drugs, weapons, Russian prostitutes, even terrorists, say Israeli security officials. Earlier, Egyptian police in Sinai claimed to have captured two teams of Palestinian militants laden with explosives. In Gaza, militants passed out flowers and candy at street corners to celebrate what one militant leader described as "the heroic act" at Dimona. A spokesman for Hamas, the Islamic militant group, which controls the Palestinian enclave, said that the attack was "a natural reaction to months of killing" of Palestinians by the Israeli forces. Various organizations also rushed to lay claim for the bombing. Israeli authorities have not yet identified the bombers, but members of two groups  the Popular Front for the Liberation of Palestine (PFLP) and the al-Aqsa Brigades  jointly claimed credit for the suicide bombing and released videos of two supposed bombers. But one Israeli official says the faces in the video seem to bear no resemblance to the dead bombers. Abou Fouad, an al Aqsa Brigades spokesman, told a press conference in Gaza that "the attack had been planned for a month, but was only made possible after gunmen bombed the fence." Palestinian President Mahmoud Abbas condemned the attack, which could derail his peace talks with the Israelis. In his statement, Abbas coupled his condemnation of the Dimona attack with harsh criticism of an Israeli army raid in the West Bank. It was not lost on the Israelis that the al-Aqsa Brigades belong to Abbas's own Fatah movement, but it has spun out of the President's control.